Cape Town – Public Enterprises Minister Pravin Gordhan did not mince words when he said the actions of controversial contractors Regiments and Trillian would be investigated by newly appointed boards of state-owned entities and the Judicial Commission of Inquiry into State Capture. 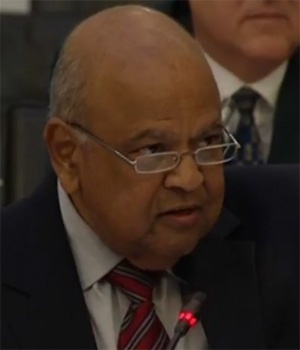 In a written response to a question from the Anton Alberts of the Freedom Front Plus' on the role of Regiments Capital and Trillian Capital Partners, Gordhan said government would get to the bottom of any alleged plunder. Gordhan described Regiments' role as "dubious and problematic", saying it, Trillian and other entities implicated in state capture would be investigated by the respective state-owned corporation boards, "and presumably by the [Judge Raymond] Zondo Commission". Alberts also asked whether trustees were authorised to give the mandate for payments to the company in question and, if not, what legal grounds the trustees had relied on to take such a decision. According to the Transnet response forwarded by Gordhan, the board said the R228m in "transaction fees" it paid to Regiments Capital were for services rendered during the structuring of key transactions. "It was found by the Transnet Second Defined Benefit Fund that no such fees were payable separately from the fee and cost structure agreed in the original investment management mandate agreement and as such not allowed," the board said. The board also said the Transnet Second Defined Benefit Fund Board of Trustees appointed Regiments Capital in terms of a detailed duly legal and approved investment agreement. No blank mandate was given. "The decision of the Trustees was in terms of the authority vested in terms of the Rules of the Transnet Second Defined Benefit Fund. The decision of the Board of Trustees was not ultra vires but in terms of the authority vested in the rules of the fund," the board said. Regiments made headlines during allegations of state capture in association with consulting firm McKinsey. Fin24 previously reported that by November 2016, Transnet had paid a total of R187m to Regiments, McKinsey and Trillian. Trillian, for its part, had contracts with Eskom that the power utility has said resulted in "unlawful" payments. Eskom has also denied making payments to Trillian. Gordhan - whose portfolio was expanded to include South African Airways on Wednesday - has previously said that state capture may have cost South Africa as much as R100bn. Earlier in the week, it was reported that the state capture inquiry, headed by Deputy Chief Justice Raymond Zondo, had been granted a two-year extension, subject to confirmation in October.